Christmas shopping comes earlier every year, and unfortunately, the prices aren't getting any lower. The good news is you can save yourself the time and money you'd spend at the stores and instead try one of the 19 Ways to Craft with Bottle Parts. These bottle crafts use everything from corks to bottle caps to make Christmas crafts that are eco friendly, but are still perfect for the holiday season. Guests will be so impressed once they see how resourceful your Christmas home decor is. Recycled Champagne Cork Bear - This festive creature will make your mantel pop. Wine Cork Wreath - With wreaths being so popular, you'll need one that's sure to stand out. Root Deer - These are an easy Christmas craft for kids that they'll definitely want to show off. Creamer Bottle Snowman - They're cool, but keep your drinks warm. The fun doesn't have to stop once the bottle is empty! Decorative Painted Wine Bottle - This bottle craft is a great thank you gift for a host or hostess. 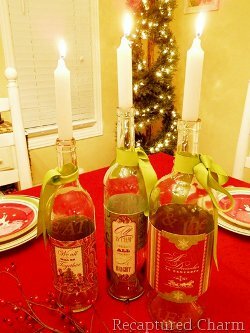 Faux Lighted Wine Bottle - You can use this to warm up anywhere from your porch to your living room. Refashioned Wine Bottle Candle Holders - For classy, but inexpensive tableware, look no further than your own kitchen. Learn one of the many eco friendly ways to craft with bottle parts. Bottle Cap Snowman Ornament - Kids love this cute snowman craft. Cork and Paper Ball Ornament - Save some special memories in a unique way. Painted Snowman Cork Ornament - No one will be able to guess how this little Christmas character was made. Plastic Bottle Bottom Ornaments - Challenge yourself with a more intricate design. How to Make a Cork Reindeer Ornament - You'll have the most adorable reindeer flying around your tree in no time. Style does not have to come with a price tag. Be your own designer this year. Bead and Cork Christmas Earrings - Everyone will be talking about your DIY fashion sense once they see these. Wine Cork Christmas Bracelet - Durable, but totally chic. Christmas Tree Cork Earrings - Working with cork is a great way to expand your DIY crafting skills. These handmade Christmas decorations each have a unique design, but all come from bottles! Bottle Cap Picture Tree - Use bottle caps to make a tabletop tree. Christmas Cork Tree - Sometimes the simplest projects end up looking the best. Plastic Bottle Christmas Tree - Learn a cool technique to create some outstanding recyclable art. Wine Cork Mini Christmas Tree - Here's another fun way to craft with bottle parts to make a craft tree. Who wouldn't love to decorate the house with a couple of cute bottle reindeer? I love this idea the most, but there are a ton of fun ideas in this section. I am amazed at all the things you can do with corks from the wine you will serve during the holidays. The earrings are the most surprising craft.